Manufacturer of a wide range of products which include manual winch machine. 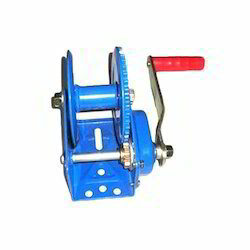 We are the leading manufacturers of Manual Winch Machine. Manual Winch Machine are designed as per IS-9507-1979 and are suitable for heavy Duty applications. Generally, Winches with Right Hand Operation are manufactured, however , the same can supplied with other side operation also as per requirement.